Full-time pastor. Occasional author. Would-be mountaineer. It’s been a bloody summer. In Iraq, Syria, Gaza, Nigeria, and the Ukraine. Kill the bad guys and there will be peace is the tired refrain. All sides say it. Ad infinitum. But I am where I always hope to be this time of year: In the mountains that I love. 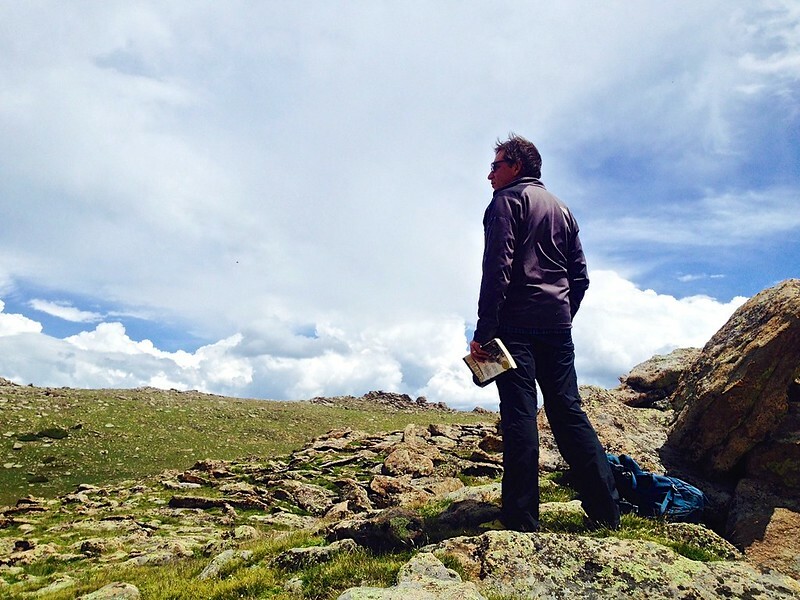 When I hike above treeline onto the great expanse of the high tundra my soul finds room for expansion. I’m no longer hemmed in by the din from the reactive ideologues. I find time and space to pray and think. Creation is good. Very good. It bears witness to its Creator, who is good too. In our primitive dread we imagine a god who is petulant and hard to please, vindictive and retributive, capricious and cruel. But these are only petty projections born of our own fear. The mystics (and maybe the mountaineers) know better. When I can clear my head, I know better. High on the tundra between Longs Peak and the Never Summer Mountains I know the greatest of all truth: God is Love. Why did God say, Let there be? God spoke because he is Love. Infinite love seeking finite compression. Eternal love seeking temporal expression. Divine love expressed as matter and motion. What is light? God’s love in the form of photons. What is water? A liquid expression of God’s love. What is a tree? God’s love growing up from the ground. What is a bull moose? One ton of God’s love sporting spectacular antlers. What is a mountain? God’s love in granite, so much older than human sorrow. At the end of time and space, there is love. God’s eternal and infinite love. All shall be well, and all shall be well, and all manner of things shall be well. When I remember these things (and they are too easily forgotten), I’m reminded that I can afford to love, because love goes with the grain of the universe. The “wrath of God” is but one way of describing the shards of suffering we inevitably subject ourselves to when we go against the grain of God’s love. God is all love…but you gotta go with the grain or suffer the pain. Selah. In a reactive world where violence begets violence the only way out of the vicious cycle is for someone to absorb the blow and forgo retaliation in the name of peace. This much is clear to any who will bother to think it through. The problem is: Who goes first? It’s a risky move. Who will be the first to lay down their weapons and pound swords into plowshares? The Russian? The Ukrainian? The Israeli? The Palestinian? Us? Them? Not me. You go first. And he calls his disciples to follow. But those willing to suffer wrong in Jesus’ name. But those laying down their rights in the name of love. But those following the Prince of Peace found in Isaiah’s poetry. Christians say, We will. We’ll gladly go first. We can afford to go first. We can risk coming in last. We can afford to lose. We can risk even death. Only those willing to suffer can answer the high calling to be peacemakers. Only those willing to trust their fate to the hands of God can be Christ-followers. Take up your cross (not your guns, not your nukes) and follow me. We find that a risky life in Christ is both beautiful and peaceful. PS: A storm just passed. There’s a dusting of snow on Mount Meeker. This too brings me peace. What is a mosquito, God’s love? What is a mosquito carrying malaria, God’s love x2? “This calls for patient endurance on the part of the people of God who keep his commands and remain faithful to Jesus.” Even in Revelation, the call is for God’s people to practice patience, not retaliation, while the world goes crazy. Thank you Brian. As always, VERY well spoken. I like your article,very good! How Does “Dying For Our Sins” Work? © 2014 Word of Life Church. All Rights Reserved.